The first of a number of very strong par 4’s. Uphill all the way and plays longer than the yardage suggests. The perfect drive is a draw past the fairway bunkers on the left. The tighter you are, the shorter the second shot. Once again, a fairway wood provides a safer option off the tee but will leave a longer second shot. The green is tucked away round the corner and will only be in a view from the fairway. The uphill second shot plays a little longer. A possible three shot strategy is best here. A drive onto the wide fairway followed by a challenging lay-up shot into a bottleneck fairway will open up a pitch onto the green. When laying up beware the cross bunkers short of the green. Going in these present that most awkward challenge, a long bunker shot. 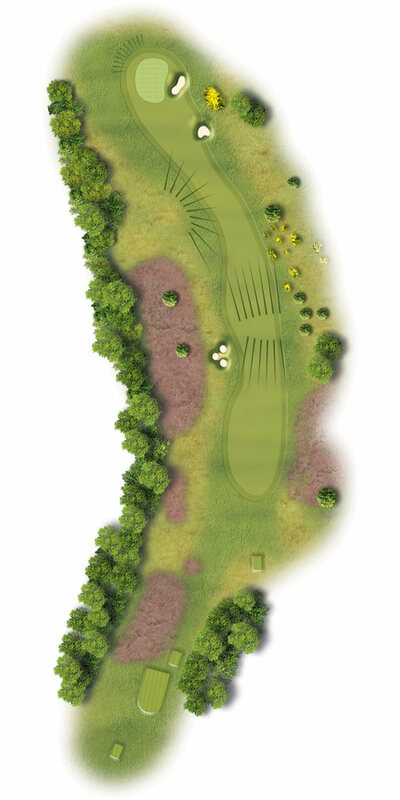 If running your shot onto the green, the ball will feed in from the left avoiding the large greenside trap.